Check that out! 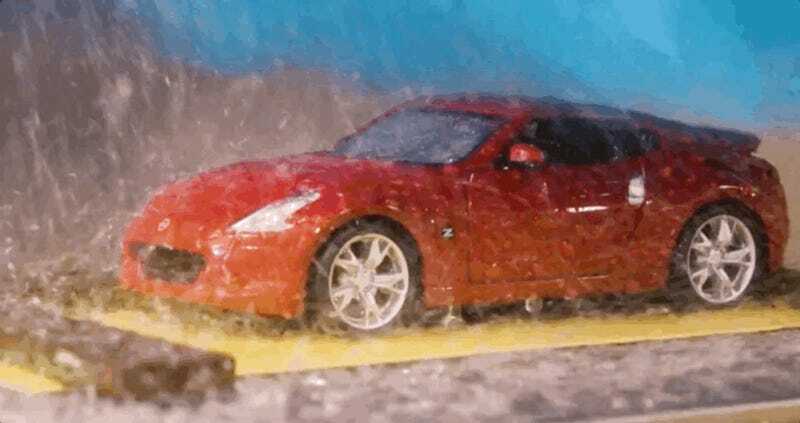 It’s a toy Nissan 370Z, the car that’s been around longer than that fridge magnet you made in kindergarten but is kind of cool because of that, bathing in a miniature car wash Nissan uses to test its paint durability. How rad is that? Nissan published a video Wednesday showing how engineers test paint samples to make sure that they can “hold up to the tough environment” and “rigors” of an automatic car wash, using a tiny version of one with 10,000 bristles that spin at 180 RPM. The video said engineers wash samples thousands of times to see how they hold up, and used a cute little Z to demonstrate how it all works. But, sadly, the coolest part of the video is all for show. Nissan doesn’t actually use toy cars in the wash, and the 370Z in the video is “for illustrative purposes only.” Engineers really just get to watch painted rectangular plates get washed thousands and thousands of times, which sounds a lot less cool or fun. But hey! Now you know how they test paint on your car. It’s the little things.